The coupling nut clamp is the angle stock with three pairs of 7/64" holes in it. Two pairs and four screws are used to clamp 1/4" coupling nut, and one pair is used to attach the clamp to the lead nut mount. Make the angle piece from SVG or PDF template, according to the instructions in Howto section. Tap the holes with 6-32 tap. File two notches on one edge of the coupling nut, about 1/8" from the ends (Dremel with cutoff wheel works too). In the side with one pair of holes, install two 1/8" screws from the inside out. Place the coupling nut flat against the opposite side of the clamp (with two pairs of holes). Install two 3/8" screws so that they go into the notches on the coupling nut. The nut should be securely clamped. 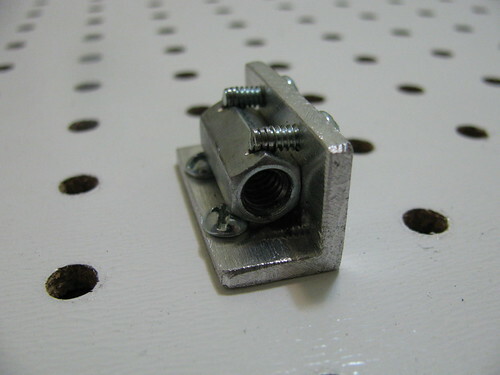 The remaining two 1/4" screws are used to attach the coupling nut clamp to the lead nut mount.